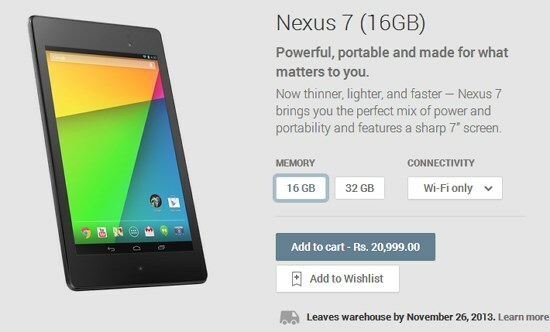 Google's latest arrival Nexus 5 and Nexus 7 (2013) both devices are officially available on Play Store in India. If you want to buy the devices, just go to the play store with below links and order your device. Google takes 1-7 working days to deliver your device if you have order. 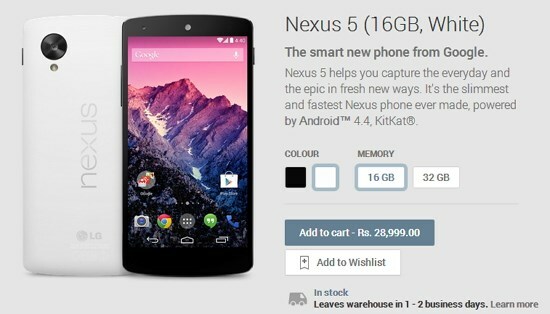 The Nexus 5 comes with 4.95-inch Full HD IPS display and runs on a Google's latest Android 4.4 Kitkat operating system. The phone powered by 2.3GHz Qualcomm Snapdragon 800 processor with 2GB RAM. The phone equipped with 8MP rear camera and 1.3MP front facing camera. The device has 2300 mAh battery which gives 300 hours of standby time and 17 hours of continues talk time. The Nexus 7 features 7-inch IPS display with resolution of 1920 x 1200 pixels. The device powered 1.5 GHz Qualcomm processor with 2GB RAM and runs on a Android 4.3 operating system. It has 5 MP rear facing autofocus camera and 1.2 MP front camera. It comes with 8.65 thin and 290 grams weight.